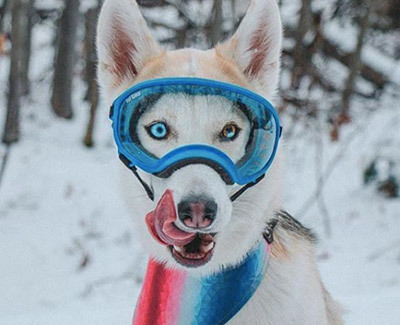 Dog sunglasses definitely turn heads and make quite a statement. BUT the purpose for wearing them runs much deeper than just looking schmick. Dogs are vulnerable to UV rays. Dogs’ eyes tend to be more recessed than ours and they usually have heavier brows than humans. 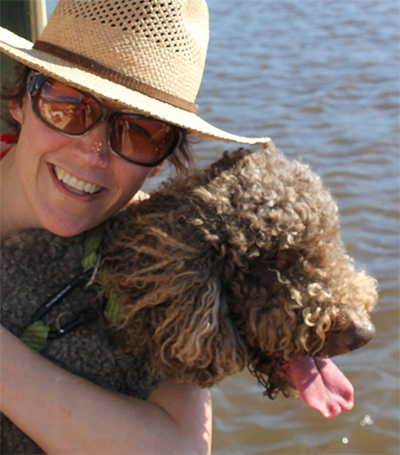 This gives dogs more inbuilt eye protection, but powerful UV rays can still impact their eyes. Ultraviolet rays can be very uncomfortable for some dogs and overexposure to UV light can be damaging for dogs with eye conditions or any pre-existing genetic weaknesses to eye conditions. #1 PANUS Also known as Chronic Superficial Keratitis, Pannus is a common canine eye disease which creates an inflammation in the cornea. This condition frequently occurs in areas where UV rays are strong and damaging. If exacerbated by sun exposure Pannus can lead to scarring and blindness. Many breeds are affected but German Shepherds are frequent sufferers. Dog goggles were developed to block out the harmful UV rays and prevent Pannus from progressing. #2 CHRONIC SUNBURN Lighter skinned dogs such as huskies can suffer from chronic sun burn around their fair eyes. If your fair furry mate doesn’t want to avoid the sun entirely dog goggles can really make a big difference. #3 BLINDNESS Dogs like to investigate. Everything. With their noses. For blind dogs this creates a distinct eye hazard. Small protruding branches – or even something seemingly harmless like a blade of grass – can cause injuries by scratching the surface of the eye. Goggles can keep them safe. #4 EYE TUMOURS Cutaneous squamous cell carcinomas are fast growing tumours that appear as a white skin mass or a raised bump. Directly caused by UV rays they occur in areas where UV exposure is elevated. Hemangiomas are a tumour of the cells that form the blood vessels. Often appearing as red to black skin pigmentation these tumours can worsen or as a result of excessive sun exposure. Eye tumours are much more prevalent in dogs with light skin and fair hair so if your dog is fair you might want to take precautions. #5 ALLERGIES The sun is definitely no mate of your dog’s allergies. Where there’s a genetic predisposition to allergies sun exposure can worsen symptoms and make treatment more difficult. #6 DRY EYE SYNDROME Wind exacerbates dry eye syndrome or keratoconjunctivitis sicca (KSC). In this disorder the components of tears are there but your dog’s immune system prevents production. Drying & inflammation of the cornea results. This appears as a swelling and itchiness in your dog’s eyes. Cocker spaniels, bulldogs, westies, lhasa apsos, shih-tzus, pugs & Yorkshire terriers are frequently affected. #7 PUNCTURE & TRAUMA Working dogs, hunting dogs and field trial dogs are at an elevated risk of getting eye lacerations and punctures from grasses and sticks. These injuries can be prevented by training your mate to wear goggles. #8 AIRBORN DEBRIS Dust and other air born debris can be dangerous for your dogs eyes. If your mate rides on a motor bike or insists on hanging a happy head out the window goggles are a safe bet. 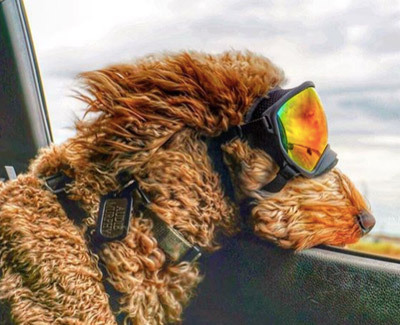 Canine goggles are used by army dogs to protect dogs from rotor wash during helicopter deployments and other dangers on overseas bomb sniffing missions. 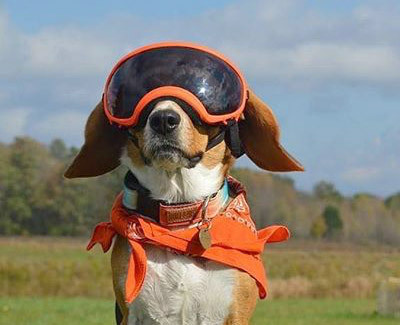 Search & rescue dogs routinely wear paw and eye protection. 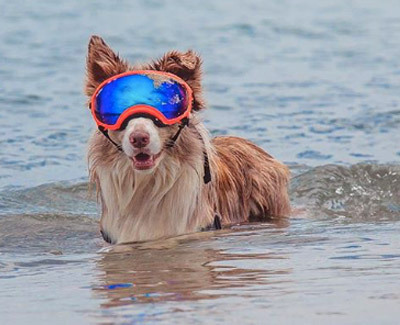 Should you worry about goggles for your healthy dog? With no predisposition toward eye issues, your mate shouldn’t run into eye issues with the sun. Dogs have a shorter life span and as a result the UV damage doesn’t usually become significant in the span of a lifetime. When you’re in safe terrain free of air born debris your mate should be fine. If you are heading into the wild bush or other more rugged environments safety goggles are not a bad idea. I wear sunnies every time I leave the house due to light sensitivity. Some dogs will be like me and just really don’t enjoy the sun hitting their eyes. They may be very grateful for the comfort of goggles. You know your mate best so you’re the best judge here. Yaz the Alaskan Husky was lacking pigment around the eyes and Tuckerman, a shepherd mix, was diagnosed with Pannus. 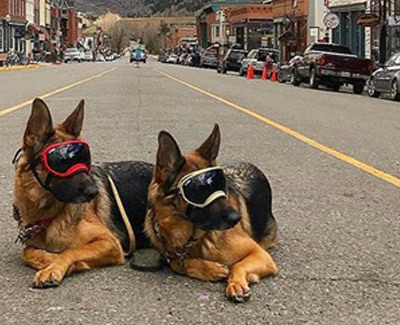 The products on the market didn’t hit the mark for their beloved dogs so Jesse + Aiden, creators of Rex Specs, embarked on creating something better. And Rex Specs was born. The large spherical lens design allows for a full range of vision. This can be an advantage over products with two eye lenses rather than one full eye shield. The soft foam edges of the goggles fit closely on your mate’s face to protect eyes from from dust and debris. The low profile adjustament strap provides a custom fit on each dog. These goggles have staying power and stay on through robust activities while still allowing full jaw motion and freedom of movement. Will my dog actually wear Rex Specs? SOME DOGS HAVE INSTANT SUCESS WHILE OTHERS MAY REQUIRE SOME POSITIVE REINFORCEMENT. Here are some tips to get your mate wearing goggles like a pro. Give the goggles a go without the lens a few times for a short period of time before introducing the lens. Just pop the lenses out before use. This way your mate can adjust to just the frame first. When all is going smoothly with no lens you can move on to the clear lens (included) before the shaded lens (also included). Let your mate try the goggles in a comfy place. Try them when your dog is relaxed, tired, sleeping or eating. 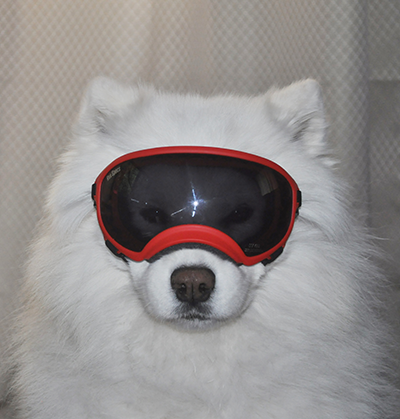 Quickly correct your dog if attempts are made to remove the goggles. Make it into a party! What does your dog love most? Pop the goggles on right before that activity. Maybe during breakfast, dinner, high value treats or a trail run. It won’t be long before your dog is thinking Rex Specs mean something WAGGLY is about to happen. Want to give your dog a go with Rex Specs? Just take the lenses out when your dog is adjusting to them. That way the lenses won’t get scratched. If you don’t feel they’ll work for whatever reason I’ll be happy to refund you if you pop them back to me in new condition. I want you and your dog to be happy. Questions? Want to have a chat about an issue your dog is having? Just give me a ring on 1300 725 781. I’m here to help! November 23, 2017 | Filed under Canine Health, Uncategorized.